NowClick2Eat offers a simple ordering service. We offer a safe & secure service with high levels of privacy. We work in close collaboration with your local takeaways/restaurants in lowering prices to save your time and money. 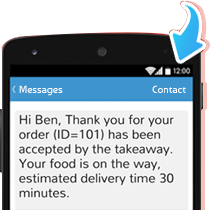 You will receive an Instant SMS & Email from the takeaway / restaurant confirming your order has been processed and estimated delivery / collection time. © Copyright 2011- 2017 Now Click 2 Eat. All rights reserved.